On 22 March the terrorist attack in London gave the British media what they crave: an event. There were dead and injured, lots of photographs and lots of 'human interest' tales to be written. Heroes, villains and victims have been identified. 'Serious questions' have been asked. Two days later the hyperventilation is starting to subside. There is, however, only one lasting conclusion to be drawn: the state cannot protect its citizens from injury or death at the hands of terrorist lunatics. The citizen stands and falls alone. We are, it is true, occasionally told that this or that plot or attack has been foiled, but are never shown evidence for this assertion for 'security reasons'. Even if we believe these statements, the events of Wednesday show us that the attack was not foreseen, ran most of its course unimpeded and was only ended through a fluke: an armed policemen just happened to be in the vicinity. We are told that the present case shows that there are security weaknesses in Parliament. There will be more concrete blocks, more robocops around the building and on view in other public places in the capital. Even at this moment, committees are sitting in official rooms around Europe working out how to protect the members of their establishments from similar attacks. But there will be no more security for the common people, because there can't be. How many pavements can be made secure? How many public gathering places can be made safe? Two days after this attack any suicidal/homicidal maniac can get into some heavy vehicle and mow people down almost anywhere and at any time. It is low-tech, unsophisticated terrorism. On 14 July 2016 in Nice 86 people were killed and 434 injured by a truck driven as a weapon. Five months later, on 19 December 2016, a truck was driven into a Christmas market in Berlin, killing 12 people and injuring 56. Now, three months after that, an SUV has been used to kill five people and injure 50. The terrorists have the advantage of surprise. When they get bored with running people over – or more likely, the media stop reporting such attacks with any real interest – they will think up something else that will surprise us and our helpless protectors. We lack imagination. The most telling examples of that lack of imagination were the attacks on 9/11. No one ever imagined that commercial airliners could be used by suicidal maniacs as missiles. Since then all the aviation security measures that have been introduced have been simply a game of catchup. Everytime a new travel restriction is introduced – contact lens fluid, shoes, laptops – we have to remember that these dangers have existed for decades, it's only now that someone has used their imagination – or, more accurately, has been forced by some surprise event to use their imagination. Our security precautions do not deserve that name because they are entirely reactions to historical events. They only protect against the repetition of the past – and even that they do badly. Lacking imagination is functional for us citizens. That deficit allows us to go about our daily lives playing the statistical game of survival. If we were to imagine just what terrorists might do in all the public situations of our daily lives, we would stay home. Most of us don't have that option, so we move around our world with our imaginations switched off. The government relies on a simple calculus of outrage: there is some number of incidents, some quantity of dead and injured, year in year out, which may excite us at the time they occur, but which we, the unaffected, soon forget. Should something happen, the political classes have an opportunity to do some moist-eyed emoting to show us how much they care. The rest of us are left to our own devices. The Mayor of London even tells his subjects that such events are really just a part of modern life. Experts pop up to tell us that, compared to road traffic accidents, say, the number of people killed by terrorism is statistically insignificant – the implication being that for public policy and administration, terrorism isn't really that important. 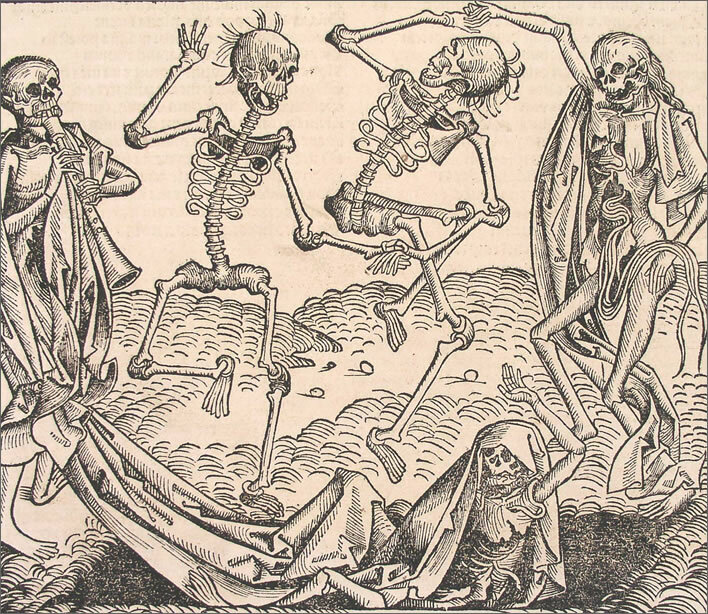 Keeping a stiff upper lip in the 'Dance of Death' from the Nuremberg Chronicle of 1493. Life goes on! After Wednesday's attack, even while the injured and the dead were still being stretchered away, the useful idiots of the 'carry on regardless' brigade were loudly touting their ideological wares. Such stoicism and phlegm are part of being British, we are told. Business as usual. No one is stoical when they are being run over or knifed to death, when in the statistical gamble so cheerfully and stoically undertaken the dice fall the wrong way. Ignorance is indeed bliss. The only way to protect the public is to stop the problem at its source, in the same way that the jet of the fire extinguisher has to be aimed at the heart of the blaze, not the tips of the flames. More concrete blocks and robocops around Parliament will achieve nothing for the general public. At the heart of this blaze we find Mohammedanism, embedded in an insular cultural identity. The exact proportion of culture, politics and religion in today's terrorism is debatable. but just as a fire requires three components to survive – heat, combustible material and oxygen – and the removal of any of these three will be sufficient to extinguish it, so the current terrorism has Mohammedanism as one of its components. Christians are not killing us, ditto Hindus, Sikhs, Buddhists, Shintoists etc. Decades of immigration into Britain have led not to integration but to cultural and social ghettos. After the bombings in London on 7 July 2005 there was surprise that the attackers were all homegrown terrorists. The rabid homicidal maniacs in Britain were British, not imported fanatics. Twelve years on, no consequence has been drawn from this fact, which has now become a yawn-inducing commonplace. And now we find out that the Westminster Bridge killer was born in Kent as Adrian Elms Adrian Russell Ajao and converted to Mohammedanism, taking the name Khalid Masood. He had a violent criminal record. Most of the other exciting details of his life have yet to be revealed, but it appears he moved into areas with high Mohammedan populations. These are problems that cannot be solved by concrete blocks and robocops. Let's see the British government fix the problems their policies have caused, instead of telling the citizenry just to keep calm and carry on.